For the designer seeking a high performance type family. Kairos successfully melds design distinction and ease of use. Noyh has a geometric structure with smooth corners – clean and friendly. Rooted in early static grotesques from the turn of the century. One of the very rare uni-width typefaces, which means each letter occupies the same space in all weights. Salamat is an elegant and sophisticated brush script. Beloved – the hand of a romantic spirit, rendered in ballpoint. A good companion for any well-deserving designer. Vanilla Shot is a smooth script family with two weights and an ornament set. The flair of the Wild West melded with a shout out to the sign painters and package lettering artists of the 1800s. A geometric sans serif with both display and text variants. Tarsus is a sturdy serif typeface optimized for text. A rounded industrial geometric stencil typeface. A contemporary slab serif inspired by the broad nib pen. Liquid Embrace is a rough ’n’ ready brush font. 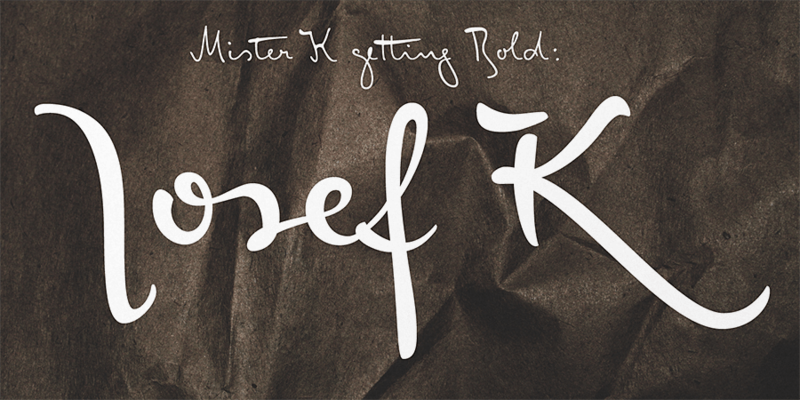 Combines a clear, self-confident stroke with the calligraphic features typical of Franz Kafka’s handwriting. BD Barbeaux is a condensed typeface with the fashionable chic of the French art nouveau. Realtime Text is a technical yet friendly design with details that serve function and visual impact alike. Ermine is derived from one of the most illuminated eras in American History.